Earlier today, we were tipped by a really awesome guy about UK carrier Three blocking Cydia servers on their 3G network. The block also affected Cydia in Ireland and China apart from UK. Three is known to block a lot of websites including but not limited to warez and P0rn. Speaking of p0rn, Cydia was also blocked in an effort to filter adult content and not to prevent jailbreaking, which by the way, was accidental. This could be a big problem for jailbreakers in the mentioned regions and so we had to look around for a solution. The solution is as simple as simplicity can get. 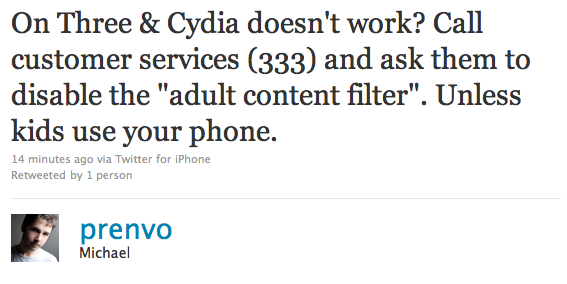 All you have to do is dial 333 from your phone on Three’s network and request them to disable adult filtration for you. The best part? You get a bonus too along with Cydia. Heh! ll 333 from your phone on Three’s network and ask them to turn off your adult content filter.